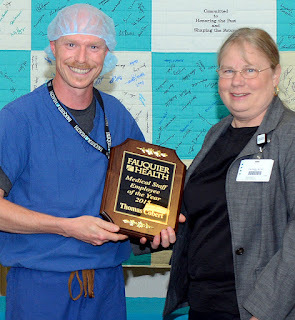 The physicians of the Medical Executive Committee at Fauquier Hospital named Tom Cobert, first assist in the Surgical Services department, as the 2015 Medical Staff Employee of the Year. Surgical first assistants work closely with surgeons to facilitate the procedure and process of surgery. Every spring, the Medical Staff names a staffer who exhibits a commitment to service at Fauquier Hospital; sustains a high level of productivity and consistent quality of work; demonstrates a high degree of initiative in performance of responsibilities; displays exceptional dependability; maintains, demonstrates and exhibits effective relationships with others, excellence in customer service, innovative problem solving and improvement initiatives. Cobert said he was humbled by the recognition. “I am extremely honored to be receiving such an important award. I have faced several challenges on my way here, but each one of them has only strengthened me to make me the person I am today; a thorough professional who knows exactly what he wants, someone who sets his eyes on a goal and does not lose sight of it until it is achieved. very special colleagues, for whom I have the deepest respect, and from whom I have derived the strength to challenge myself and perform better at each stage.